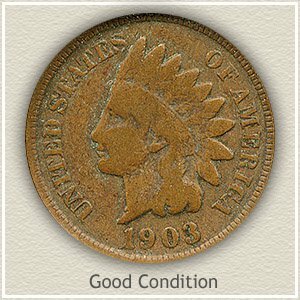 Condition determines your 1903 Indian head penny value. Hopefully some of the finer details remain on the coin, if so, your old penny is increasingly worth more to collectors. 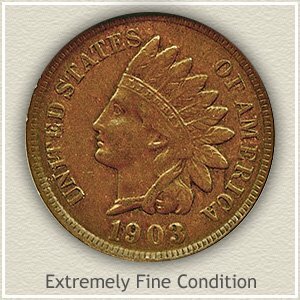 Pictured is an "uncirculated" 1903 Indian penny and because of its like new condition it displays all of the original detail. Collectors and dealers search for these top quality examples and because of their rarity are highly valued. Your coin may not be uncirculated, without wear, but nice examples with ample detail remaining are welcomed to many collections. 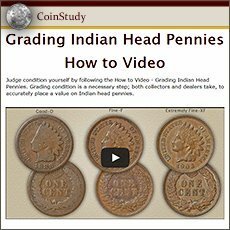 After a first look at the value chart see the descriptions and "grading" images of Indian pennies below. Today’s demand does exceed the small remaining supply of better quality, well preserved 1903 pennies. Vast numbers of these coins have been lost to time and heavy use. 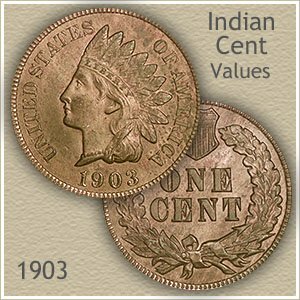 Realize your coin belongs to an important sub set of 1900 through 1909 Indian pennies. These years are collected as a group by many. Further more, an affordable 1903 penny is a great coin to start a beginning collection. Excitement and demand puts these at the top of many want lists. Stunning multi color sets the 1903 Indian penny pictured apart from most. Copper is an active metal quickly fading away from its original bright golden red to the tan-brown seen on circulated coins. Not so with the coin here. Blazing gold backgrounds light up the deep red colors of the headdress and portrait. Catching the eye of many collectors. Normal nicks, bumps and abrasions are not an issue, thankfully absent. Indian pennies of this quality are rare and seldom offered for sale. Value was left to the collectors market to determine as multiple bidders in a David Lawrence rare coin auction competed to acquire this coin. Eventually 1903 Indian head penny value settled at $172. Definitely eye appeal added to the excitement and eventual price paid for the rare condition Indian penny shown. Within your group of old coins, likely one or more stand out as attractive, it is these coins worth a second look. Visual appeal often adds to the overall value. The value chart lists coins in different "grades" depending on the amount of wear. Known as grading, compare your coin to the images plus descriptions and find the best match. You now have a better indication of its value. 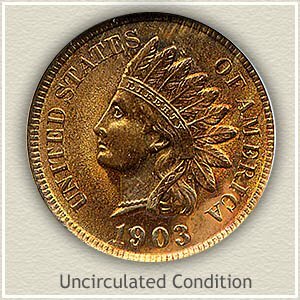 Uncirculated: For a coin to grade "uncirculated" and at the top of 1903 Indian head penny value no wear is present to its surfaces. Close examination is made to the ends of the feathers, hair and headband above her eyebrow and cheek and neck. These areas are the highest parts of the design and in the case of the neck and cheek, quickly show any wear. Rotate the coin at an angle to you eye. Wear appears as a different color in the metal, compared to the surrounding non abraded surface. 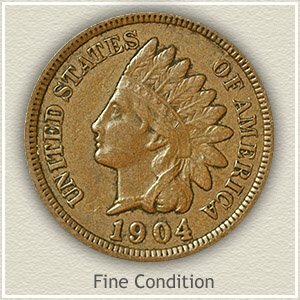 Extremely Fine: 1903 pennies found with crisp, sharp detail and only a small amount of wear are in "extremely fine" condition. First determine if the top and bottom of the headband shows ample detail. Next, if all of "Liberty" is clearly visible it puts your coin in a select group worth a strong premium. Additionally, her eye brow and cheek must show almost complete roundness with only small areas of flatness. Confirmation is made with a distinct ribbon crossing over the hair curls behind her neck. Fine: Time spent in circulation has merged the hairline and headband and continues down the neckline fading the ribbon and hair curl where they meet. One positive is the major details of the feathers are evident and each feather is separated from the next. Clearly a coin that has seen moderate wear but still has some sharpness. Good: Extensive use has worn most of the design to a shallow relief with little detail remaining. Your coin is now at the minimum collector grade known as "good" condition. The area surrounding her eye is slightly defined. Just visible is a separation of chin and neck. The headdress and feathers are worn smooth showing just an outline. Although the lettering and date are heavily worn they should be separated from the rim. Your 1903 Indian head penny value may be at the low end of the scale but because of its history they remain an important coin.